The herb thyme, Thymus vulgaris, is well known for its culinary benefits. It grows in a small unassuming way and blooms happily in full sun. But in the world of essential oil, thyme leaves distill into at least seven different chemotypes, each with its own unique chemical composition. The linalool and thujanol chemotypes are used most frequently in aromatherapy. In general, the antimicrobial and antiviral benefits of thyme are outstanding against an array of microorganisms including staph, strep and Candida. The thujanol chemotype, containing up to 50% terpene alcohols, is one of the few oils effective against Chlamydia. It stimulates immune response as well as the regeneration of liver cells and has such a broad spectrum of action against many infectious conditions that it’s appropriate for a traveler’s first aid kit. It’s especially suitable for treating flu, bronchitis and vaginitis, and when inhaled in minimal doses, thyme is a most effective expectorant. The linalool chemotype of thyme EO is skin-friendly, has a sweet “green,” lightly medicinal aroma and is an effective antiseptic and antibacterial agent. It’s used to heal weeping acne and rashes resulting from poison oak, ivy and sumac or general contact dermatitis. Use thyme EO in cleansers, astringents, lotions and masks for acne and blemish-prone skin. It can be used topically to treat strains, sprains and swelling as it has analgesic properties that increase circulation. An infusion of thyme leaves produces an astringent liquid for oily or combination skin or as a cleansing wound wash. Powdered thyme is a good antibacterial and deodorizing agent in body and foot powders. I mention infusion and powder applications because many of us are looking for effective natural skin care products. Clearly, our little, unassuming herb, Thyme, is a powerhouse of chemicals with the ability to penetrate the cell membrane and influence cellular metabolism. It has a very big presence on the essential oil stage! 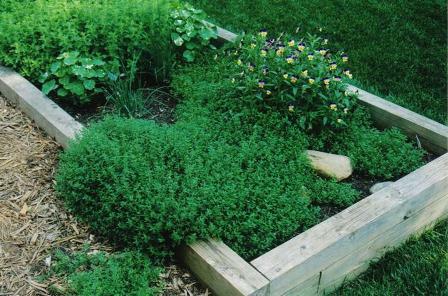 Thyme crawls out of bed in Debbie Moore Clark’s Culinary Herb Garden. Herbal infusions are potent water-based preparations that extract the medicinal properties of dried herbs for drinking or using externally as skin washes, compresses and the like. A quart canning jar is the perfect container for making infusions. Just place one ounce or a large handful of dried herb into the jar and fill with boiling water. Replace the lid tightly and let the concoction steep until it’s completely cool, and then strain out the plant material. Tip: An electric coffee grinder is an excellent tool for the home alchemist, which may be used not just to grind coffee beans, but also seeds, apricot pits, small amounts of nuts, and other spices, such as cinnamon sticks. Whirl a few teaspoons of rice inside to help clean out stubborn, pungent dust. Organic Body Care Recipes, Stephanie Tourles; Emily Via @ www.eoils.net; www.herbalrediesinfo.com. 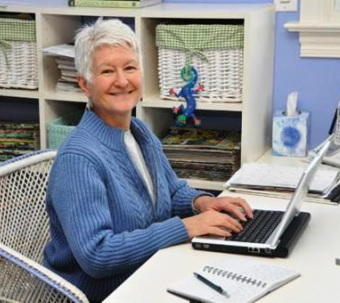 Tonya Banbury is an Extension Master Gardener Volunteer with Mecklenburg County, NC. Her series of articles on Medicinal Herbs: Essential Oils is based upon documented research and personal usage experience. Got GARDEN questions? Get answers! The more you know, the more you can grow.